Quite the weekend for the Cleveland Indians, who finished off the Texas Rangers on Sunday for a three-game sweep of the series. It was the Tribe’s first three-game sweep at home against the Rangers since 1980 – so long ago that current Indians broadcaster Rick Manning was on the Tribe roster that year. (Manning hit .234 for the Indians that year, appearing in 140 games for a Tribe team that was 79-81, good for sixth place in the A.L. East, in case you were wondering). The Indians did not pick up any ground on Detroit over the weekend, thanks to the fact that the Phillies stink, but they did pick up two games in the wild card standings and now sit just one game back of Baltimore for the second wild card spot. Not a bad place to be heading into the final week of July. Ubaldo Jimenez threw what was probably his best game of the season on Sunday, working eight innings and giving up just two hits while striking out six to help the Tribe shutout Texas for the second game in a row. It’s the first time that Jimenez has pitched eight innings in a start since June 1. And speaking of June 1, since then Jimenez has gone 4-2 with a 3.42 ERA. We’re not drawing any conclusions from that, we just wanted to point out that he’s been pitching pretty well for two full months now. Jimenez somehow managed to top the outing that Justin Masterson had on Saturday night, when he blanked the Rangers for 7.2 innings, while striking out eight and giving up just five hits. 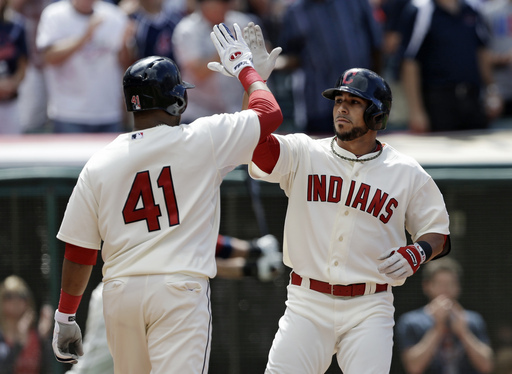 The Tribe won that game, 1-0, with the lone run coming on Michael Bourn’s lead-off home run in the bottom of the first. According to STATS LLC and Elias Sports Bureau, that was the first time in franchise history that the Tribe won a game in that fashion. Yep, it’s turning into that kind of year. While the Tribe is just 5-4 since the All-Star break, the starting pitching has simply ridiculous (in a good way). The starting rotation of Masterson, Jimenez, Scott Kazmir, Corey Kluber and Zach McCallister have combined to throw 58.1 innings, striking out 53 and posting an ERA of 1.70. If they can somehow keep that up (or at least stay productive) that takes some of the pressure off general manager Chris Antonetti to overpay for a starting pitcher at this week’s trading deadline. This is going to be a key week for the Tribe. They have a four-game series against the last-place White Sox (40-61), followed by a three-game trip to Miami to take on the equally bad Marlins (40-63), before coming how for what could be a monster four-game series with Detroit. While the Indians team is far from one that you can comfortably say any game is a “gimme,” at this stage of the season the Tribe simply has to take care of business against teams like the White Sox and the Marlins if they want to make a serious run at the playoffs.